If you follow me on Facebook or Instagram, you know that every Friday night Scott and I have a TGIF celebration with a glass of wine. 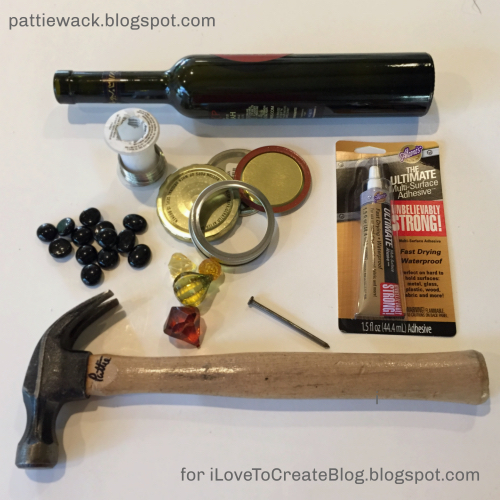 Naturally I have always wanted to do something fun with recycled wine bottles. 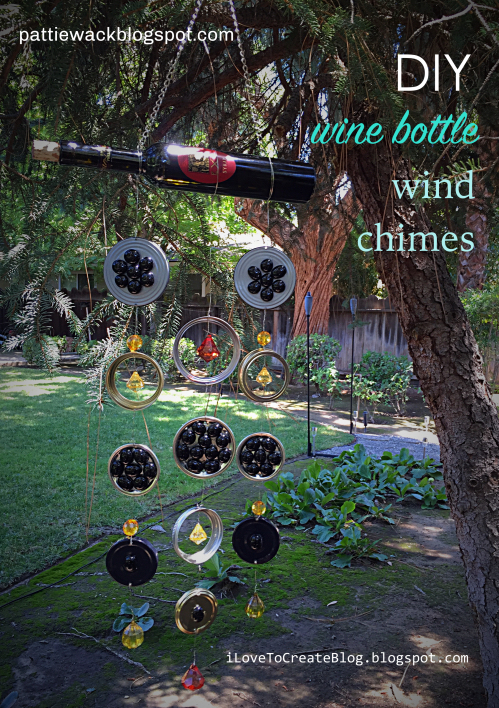 So, I combined my love for wine with my love for Aleene's glues, and created these wind chimes. 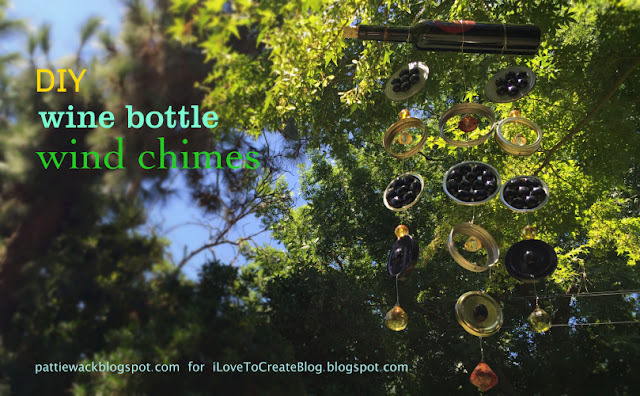 The brand new Aleene's Ultimate Multi-Surface Adhesive™ is great for use on metal, glass and other surfaces, so I knew it would be the perfect choice for my Recycled Wine Bottle Wind Chimes project. Punch holes in the tops and bottoms of the recycled lids with your hammer and a large nail. Then line up the lids into 3 rows. I did mine in an even design, but you can lay them out any way you like. I also placed my beads and baubles where I wanted them. Next, I threaded the 24 gauge wire through the punched holes to string the 3 rows together. It's smart to keep them laying on the table as you work so that you can keep everything even and be able to see how it's going to hang. Be sure and leave at least 12 inches of wire at the top of each row, and put a large bobble at the bottom. You could even add corks at the bottom to carry out the wine theme. Now to jazz up the boring lids, you can glue on the flat glass stones. 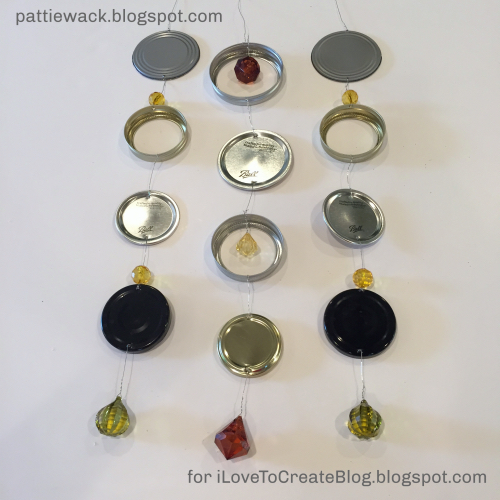 Be sure both the lids and the stones are squeaky clean so that the glue sticks really well. Especially since you'll probably hang the wind chimes outdoors. 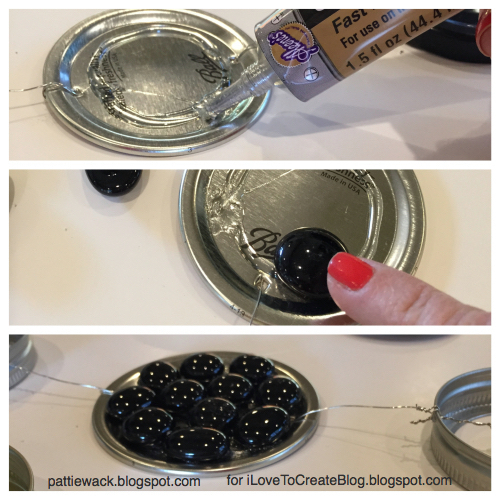 Squeeze a dot Aleene's Ultimate Multi-Surface Adhesive™ on the backs of all the stones and let them set for about 2 minutes while you squeeze glue onto the jar lids. Then press each stone onto the lid. Let the glue set for 24 hours before hanging outdoors to insure adhesion. Wire the 3 rows of chimes to the recycled wine bottle. 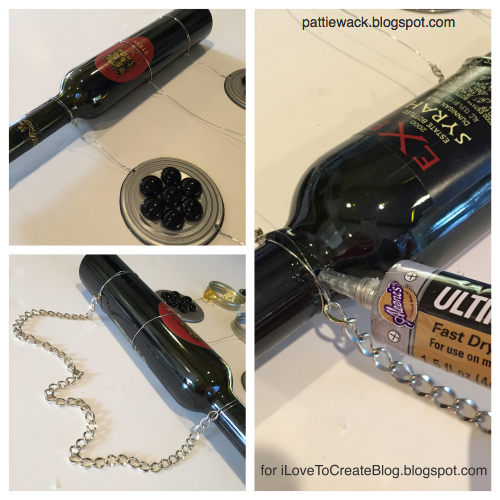 Wire a heavy chain to the other side of the bottle. And then add Aleene's Ultimate Multi-Surface Adhesive™ to keep the wire from sliding around on the glass bottle. Let it dry, and it's ready to hang!